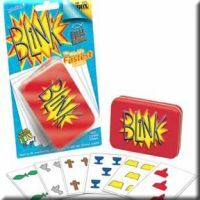 The Blink: Bible Edition game is an exciting card game that requires individuals to quickly recall specific Christian symbols, quantity, or color when prompted. The cards are flashed very quickly, thereby requiring a sharp eye. This is a fun, interactive, action-packed activity that the entire family can enjoy.